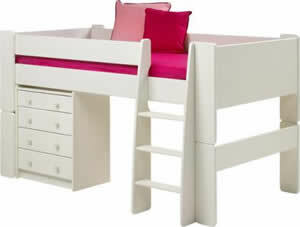 A Kids bedroom will benefit from the extra storage space underneath a Mid Sleeper Bed. Mid Sleeper Beds (also known as Midsleeper Beds) have one top bunk and space uderneath for bookcases, drawers or anything else you kids want to store. Whilst headroom is not as good as a High Sleeper Bed this is still an very useful way to utilise space in small childrens bedrooms.